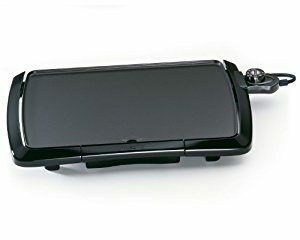 Presto 07047 Cool Touch Electric Griddle has also been successful to satisfy its users. This Presto griddle offers a large cooking surface of 10.5”x16”, hence it is perfect for cooking enough food for the family. 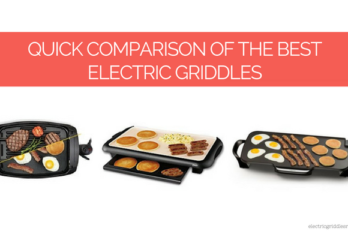 While this has much larger surface compared to small electric griddles available in the market like Presto Liddle, there are enough griddles that can compete with the size of its cooking surface, so it is not unusually big. It features a built-in backstop ledge for easy food handling. 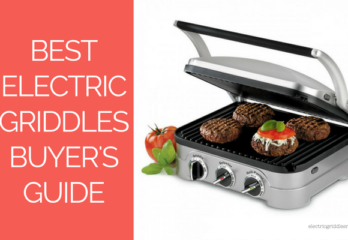 You can cook all kinds of delicious foods on this from pancakes, French toasts to grilled cheese and more. Whether it is breakfast or lunch or dinner, there is plenty of room for cooking several things at once. The body of this Presto electric griddle is made of cast aluminum, which is light, quite rigid and good for even heating. The cooking surface has a premium nonstick coating that reduces the amount of oil needed and making the food healthier. Safety measures need to be taken not to scratch the surface and metal instruments should not be used as they scratch and peel out the nonstick coating. It’s rated 1300 watts of power and that works with any 120v outlet. You can regulate temperature by a temperature knob, it maintains even heat ranging from an undefined ‘warm’ up to 400ºF. Like any other electrical appliance, it is important to read the manual that comes with the product and follow the given instructions. The removable drip tray is under the griddle that catches greases and drippings while cooking. Its cool-touch base surrounds the cooking surface on the front and both sides, which allows easy maneuvering of the unit. The nonstick coating on the cooking surface prevents the food from sticking and makes the cleaning process easier. Its heating control is detachable and after its removal, the griddle is fully submersible in warm, soapy water for cleaning. This has removable drip tray that drains the excess grease while cooking and also makes the easy cleanup. 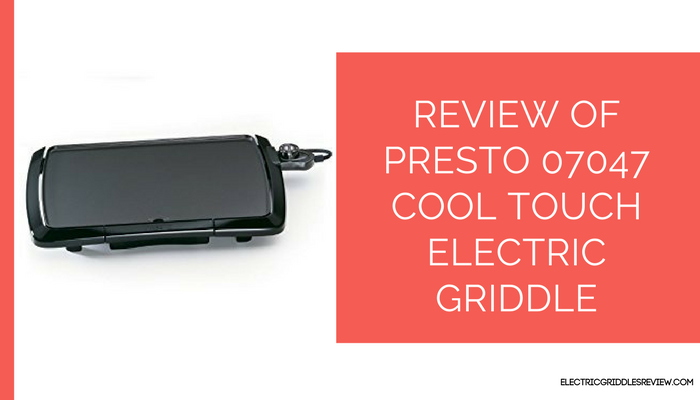 This model of Presto cool touch electric griddle is also dishwasher safe. This doesn’t take a lot of space; neither on your kitchen counter when using it nor in the cabinet while storing. You can easily store it in one of your kitchen cupboards. If maintained properly, the large cooking surface with nonstick coating does a nice job. Its cool-touch base surrounds the cooking surface on the front and both sides, which allows easy maneuvering of the unit. It can also be used as buffet server because of its attractive low profile design. This Presto 07047 is the best deal for the money; it offers large cooking surface with excellent nonstick surface and cool touch base. This can be an ideal for you if you want large electric griddle that can be cleaned easily. If you are thinking of getting one for your kitchen, you can check its price here.